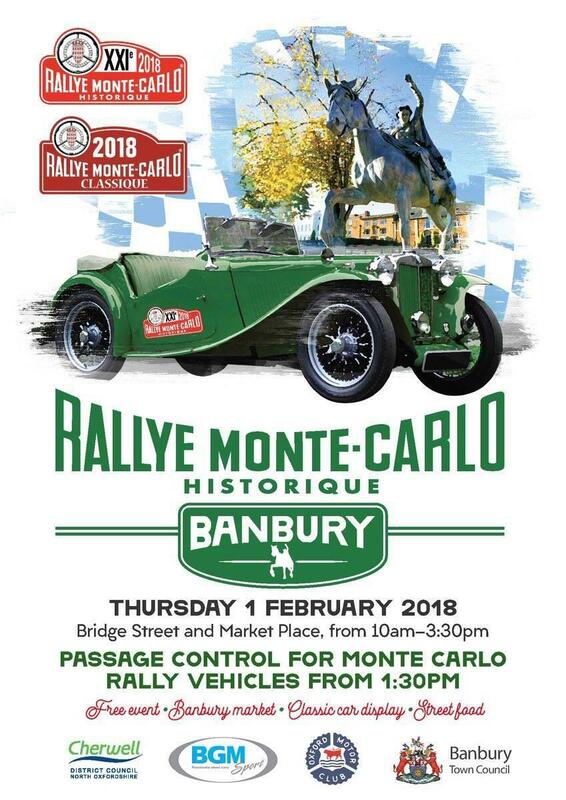 A quick reminder that the ‘Rallye Monte-Carlo’ will be in Banbury Town tomorrow, Thursday 1st February 2018. From 10:00am-3:30pm approximately 100 static cars will be situated in the Marketplace, in front of M&S and Debenhams and around the Town Hall. Rallye cars will arrive from mid to late morning morning, parking in Bridge Street. They will then leave Banbury from 1:30pm, at one minute intervals, to their next passage control in front of the Town Hall and will exit via the Marketplace and Parsons Street. Please note that road closures are in force from 6:00am tomorrow from the bus station, so there will be no access to the main town centre. Bolton Road car park will remain open for the event, and the market will be running with additional street food outlets around the event area.